The opening fight scene is like #Inception on speed. The #StrangeTechnique. Is that in #KamaSutra? There goes his surgeon’s hands. Time for a #CareerChange. “This isn’t medicine anymore, it’s mania.” Listen to her, #Strange. #Strange’s scribbled signature is still more legible than most doctor’s. Good news: #Strange got his watch back. Bad news: it’s broken. “Just how experimental is your treatment?” Don’t ask. “Study and practice.” Something #Strange is all too familiar with. #SlingRing #Strange can’t even muster a sparkler. The #Astral fight in the hospital is mind-blowing. A true original. #MasterStrange Has a nice ring to it. “That is hilarious!” #StanLee sighting. “It’s not about you.” #TheAncientOne says. Also the opening line of #ThePurposeDrivenLife by @RickWarren. “I’ve come to bargain.” Ad nauseam. Final analysis: a mind-bending adventure with just as much philosophy and metaphysics as action. #Marvel should stop making movies, because they’ll never top this. Rating: 3 1/2 out of 4. #Cumberbatch shines in an #Inception meets #HarryPotter tale of healing and heroism. 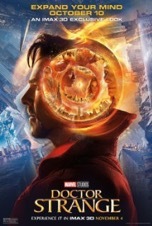 As one of the lesser known characters in the Marvel panoply, Doctor Strange is an altogether different kind of hero since his body is broken and he possesses no superhuman abilities. In lieu of innate powers (or acquired ones like from the bite of a radioactive spider), Strange must rely on his mind, specialized physical training and amassed knowledge of the mystical world that surrounds us and penetrates us (oops, wrong movie). Strange, the forty-third (some lists say fifty-sixth, but who’s counting) Marvel movie, isn’t directly connected to the Avengers—despite the surprise cameo during one of the two ending credits bonus scenes—or any other team or stand-alone hero in the Marvel pantheon. At first glance, the movie appears to be a mélange of narrative devices and stylized shots from the extant body of sci-fi and superhero films, especially the works of Christopher Nolan. The most obvious antecedent to this film, particularly in how its characters can bend cityscapes into Escher-esque labyrinths, is Inception (2010). However, instead of merely manipulating urban architecture, Dr. Stephen Strange (Benedict Cumberbatch) and his fellow spell-casters can terraform structures at will, making floors drop downward into a pit or heave upward into a giant mound while also causing rooftop tiles to undulate like the scales of a slithering serpent. The movie appropriates Nolan’s malleable metropolis concept and kicks it up several billion notches by staging protracted, pulse-pounding action sequences in, on or atop morphing, collapsing buildings. The results are, in a word, mind-blowing. These action set pieces seem readymade for a video game, which you can bet is already in development and will arrive in stores just in time for Christmas. Another tip of the hat (or cowl) to Nolan’s films is Strange’s martial arts instruction, which mirrors Bruce Wayne’s (Christian Bale) training in the first act of Batman Begins (2005): Liam Neeson’s immortal necromancer Ra’s al Ghul is replaced in this film by Tilda Swinton’s Ancient One. The Ancient One and her team of sorcerers control three Sanctums (New York, London and Hong Kong) which are linked by portals that open like the shimmering threshold (sans circular frame) of the titular device from the Stargate TV series and original 1994 movie. There’s also a heavy quotation of the Harry Potter films here in the way Strange learns how to conjure weapons and shields with the incantation of ancient spells. The list of comparisons between Strange and other blockbuster franchises is extensive, but suffice it to say, this film owes a tremendous debt of gratitude to its creative progenitors. That doesn’t mean that Strange is derivative though. Much more than a standard sci-fi/fantasy pastiche, Strange is an amalgamation, indeed a culmination, of the finest story and visual elements the genre has to offer, mounted with lavish detail and delivered as a bold, new vision of what a superhero film can achieve artistically. And while handing out plaudits, let’s not forget the movie’s sterling acting. Cumberbatch is unequivocally masterful at bringing Strange to life. Few actors could modulate from pompous surgeon to physically and mentally broken seeker to whole and fully-actualized hero with such deftness (the only person that even comes close is Harrison Ford, who negotiates a similar character trajectory in the 1991 drama Regarding Henry). Cumberbatch is one of the finest actors of our generation and was the optimal choice to play Strange…the fact that he looks the part only serves to enhance the role. The rest of the cast is equally effective, especially: Rachel McAdams as Strange’s long-suffering girlfriend, Swinton as his mysterious mentor, Chiwetel Ejiofor as his upperclassman trainer and Mads Mikkelsen as former Ancient One initiate turned evil (a la Anakin Skywalker from Star Wars and Lucifer from the Bible). Mikkelsen, who played the villain in Casino Royale (2006) and the eponymous cannibal in TVs Hannibal (2013-2015), is sufficiently menacing here as Kaecilius, a Sith-like henchman whose skin-crawling mystique comes complete with a thick European accent and ashen rings around his eyes. Aside from the movie’s visual splendor and fine performances, the element that elevates Strange far, far above the finest films Marvel has produced to date is its finely-crafted story. Strange is perfectly paced and contains an almost alchemic balance between character beats and action sequences. After a condensed origin story and training section, Strange encounters Kaecilius for the first time about halfway through the film. This first-rate action sequence is an edge-of-your-seat nail-biter since everyone in the audience knows full well that Strange is nowhere near ready to take on the wicked wizard all by himself. This lopsided sorcerer’s duel is basically like an alternate version of Star Wars: Episode IV - A New Hope, where Luke, not Obi-Wan, confronts Darth Vader on the Death Star. However, with his minimal training in the Force at that point, I doubt the farm boy would’ve fared as well versus the Dark Lord as Strange does here against Kaecilius. To counterbalance its many glum and globe-shattering passages, the film offers several humorous asides, like when Strange borrows books from the closely-guarded library. But these sporadic moments of levity are quickly relinquished for more pressing plot points or metaphysical musings. One such subplot foregrounds a variation of Taoism where an otherwise virtuous person requires a little dark energy in order to live long and prosper. This, and many other thought-provoking scenes, affirm Strange’s status as a master course in philosophy (as well as religion and ethics) since it makes us question everything about the world around us and, indeed, the very nature of our own existence and purpose. This is decidedly heady material for a superhero adventure, and I for one am completely sated from the four course meal (story) plus dessert (action sequences) I got for the price of admission. Strange is Marvel’s missing link: whereas all of the studio’s films boast immaculately choreographed, eye-popping action scenes (which serve as the majority of the plot in many cases) this movie actually features a story with some salience and heft. Strange tells its tale on a grand stage and envisages an even grander view of the universe and our place in it. One of the most dubious comic-to-movie adaptations ever produced is, ironically, the film that has set the bar so high that the studio may never be able to match or supersede it. So now the burning question is: will Strange ever be eclipsed by a future Marvel film? Although it seems highly unlikely at this point, stranger things have happened.